Kessler is excited to announce the pre-sale date for CineDrive. 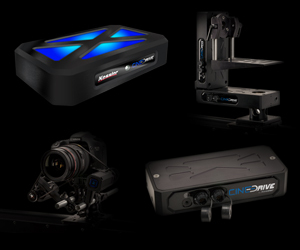 * CineDrive is the most advanced motion control system on the planet. With its near limitless connectivity and multi-axis control, it will be the only system you’ll ever need to buy. Take control of the super intuitive interface with fully configurable key frames, Bezier curves and precision positioning. This digital encoded system will bring your motion control game to a new level. Whether it’s visual effects, time lapses, live action or stop-motion, CineDrive does it all. Pre-sale orders will begin at 1 PM ET on Wednesday, August 29. The sale will be limited to 25 orders at a first-come first-served basis to US customers only and with a one CineDrive system per customer limit. A second batch of CineDrive systems should be available in 1-3 months. CineDrive systems will start shipping in September after final FCC approval has been attained. Find out more by visiting kesslercinedrive.com and purchase your CineDrive system at kesslercrane.com on August 29. * Formerly known as Fusion. The Kessler CineDrive: Setting up a Basic 5-Axis Move from Kessler Crane on Vimeo.